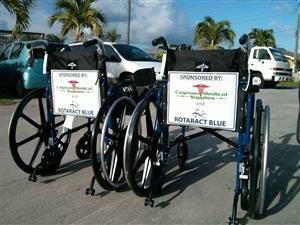 As a result of recent donations, Rotaract Blue is proud to launch its wheelchair rental programme. Through this newly developed programme, used wheelchairs will be provided at a minimum rental fee - especially to those families who are unable to afford brand new wheelchairs due to lack of health insurance or financial strain. Cost to rent is $7 per week or $25 per month. Proceeds from the rental programme will be used to purchase additional chairs. If you know someone in need, a copy of the form can be found on the left of our home page under 'Downloads'. Thanks to Cancer Society and Cayman Medical Supplies, a total of 12 chairs have already been donated. For additional information on Rotaract Blue’s Wheelchair Rental Programme or to become a sponsor, please contact rotaractblue@gmail.com.